Before her wedding, it was definitely her mother who selected the young bride’s trousseau (outfits). After her wedding, in the beginning it was her mother-in-law who took charge of Sisi’s wardrobe. Archduchess Sophie was well-known about hating Hungarians and everything that was Hungarian, however, ironically, it was her who gave the very first Hungarian dress to the young Empress. 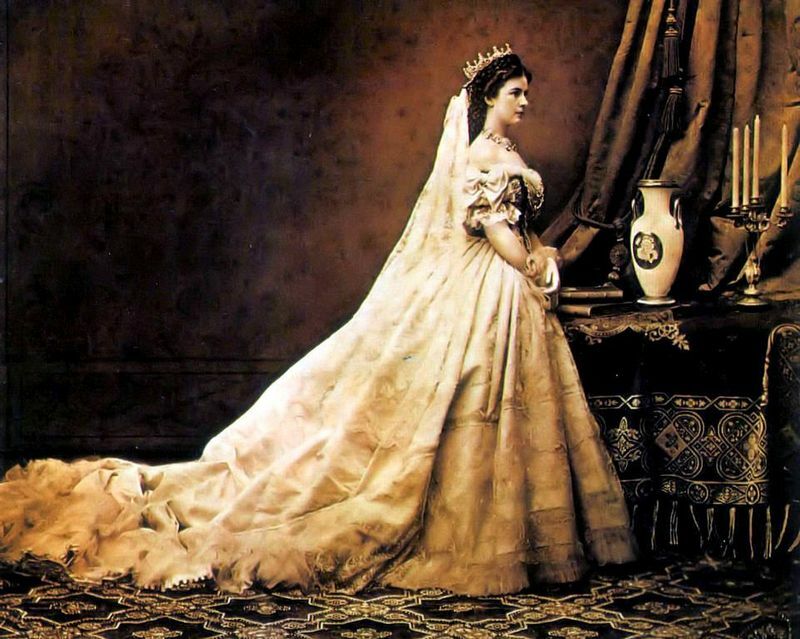 It was the gown Elisabeth was wearing when she met the Hungarian delegation during the following days of her wedding. This reception was followed by Sisi’s first court prom as an Empress, on which she was wearing a white dress with a thin brilliant belt around her waist, and her head was crowned by white roses and a tiara. Later, of course, Elisabeth chose her own clothes and have them designed according to her own style, which was not dependant on the actual fashion but on her delicate taste. Not only the Viennese court companies but also the most elegant Parisian tailor, Worth made her dresses. Furthermore, she frequently had clothes delivered by Hungarian fashion companies as well (F. Dózsa, 113-114). Sisi was especially fond of combining black and white from the 1860s as it can be seen in many images of her. This colour combination is also striking on her royal coronation gown, which was made by the Parisian tailor, the above-mentioned Charles Frederick Worth. 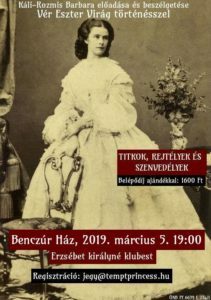 It must be noted that this black-and-white combination is mainly for expressing Hungarian morning, for the occasion of the coronation, a red, green or blue velvet dress would have been more suitable, in accordance with this, her ladies-in-waiting were wearing colourful dresses. However, this beautiful black-and-white dress suited Sisi perfectly. My personal opinion is that one of her most stunning images were taken of her in this gown. Unfortunately, the dress was not preserved, however, thanks to a thorough work, more reproductions of it has already been made, which are probably as beautiful as the original one was. NOTE: It is important to note that the dress in the photo (below) is not the one which was worn by Elisabeth during the coronation ceremony of 1867. It is the one worn during the official photo session in Emil Rabending studio, taken much in advance, a year earlier in 1866. It also indicated how much Sisi was preparing for the Hungarian coronation... The dress worn on the ceremony was much more expensive and more thousand of little diamonds were glittering on that. The trustful replica of the dress (decorated by Swarovski crystals) was made by Mónika Czédly and was first exhibited on the occasion of the 150th anniversary of the coronation in the Royal Palace of Gödöllő. 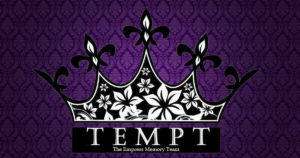 Was white another favourite colour of the Empress? 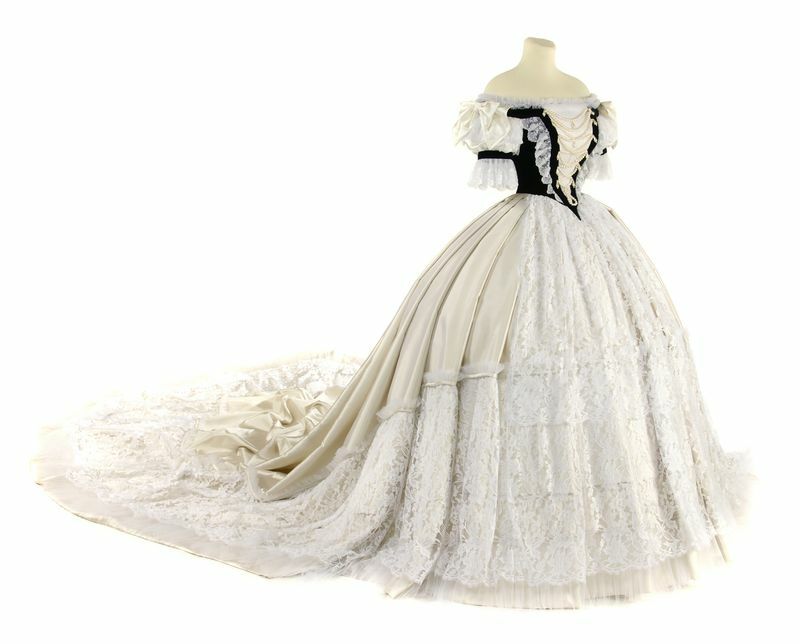 Beside violet and lilac, white must have been Elisabeth’s favourite colour since she not only combined this with black but also with silver or gold and sometimes with green - her farewell dress is also green and white but it must have been selected by her mother as it has already been mentioned above. One of the most famous paintings of Elisabeth was made by Franz Xaver Winterhaltar in 1865. In this picture, Sisi is wearing a gold-embroidered white prom gown covered by tulle. The famous diamond edelweisses (often regarded as stars, however, they were formed after the flower, edelweiss) can be seen in her hair. The black dress suited Sisi perfectly not only at her younger ages but also during her entire life since it emphasised her slim, tall figure and thin waist. Elisabeth loved simplicity and clarity. She refused to wear expensive jewellery and other accessories on weekdays, and felt rather unwell while being dressed up in fancy clothes. (She wrote a poem about it.) One can imagine how heavy some of her dresses were. One, of which a painting can be seen in her former suite of the Royal Palace of Gödöllő, was said to weigh 50 kg. After her only-son, Rudolph’s death, expect some occasions, she only wore black but her accessories were white (black and white combination again): white parasol, white or black lace fan were also her essential companions. She hid her face behind her fan or her parasol whenever she met people or realized that someone wanted to capture her image. After the age of 30, the Empress did not let any photos be taken of her, so her older face is unknown (this will be the topic of another article, as well as her death mask prepared secretly). Most Sisi-fans know that after the tragic death of her son, Crown Prince Rudolf, Elisabeth was constantly mourning (as far as her outfit was concerned) and was not willing to wear anything else but black. She was said to make only a very few exceptions, such as her youngest daughter, Marie Valerie’s wedding, where she was wearing a lilac dress. The expression of mourning by wearing black outfit was intended to persuade people to keep away from her. Hiding her face was meant to cover her ageing skin, presenting her legendary beauty for the eternity. The following is highly important to be noted. As mentioned above, Sisi had her slender figure dressed in black in the countries of the monarchy, where she was well-known. However, outside the borders of the Austro-Hungarian Monarchy, where only some knew that the graceful, slender middle-aged (or later elderly) woman with a lovely face was the Empress of Austria (Elisabeth usually travelled under pseudonym), Sisi might have preferred wearing light-coloured dresses. Two special pieces of her Corfu wardrobe have been preserved supporting this idea. The so-called "blue dress", which appeared in a not very attractive wooden box in a Munich auction in 2012, and the light-coloured pink dress with dolphin motifs, both of them belonged to Elisabeth Corfu wardrobe. Sisi started to have her stunning palace, the Achilleion built in Corfu (the place outside the Monarchy) a year after the Mayerling Incident of 1889 - the death of the Crown Prince Rudolph.